Yesterday, Grand Duchess Maria Teresa visited the nursing home Saint Joseph in Pétange that has specialised in helping older people with dementia. The visit was part of a number of intergenerational meetings between the elderly, children and adolescents. To start her visit, the Grand Duchess was presented with information about the history and infrastructure of the nursing home by its director. Afterwards, she engaged in exchanged with those present and participated in group activities that were prepared by residents of the nursing home and children from the nursery Kordall. A reception topped of the visit. The Hereditary Grand Duke and the Hereditary Grand Duchess have quietly finished up their first economic mission together. 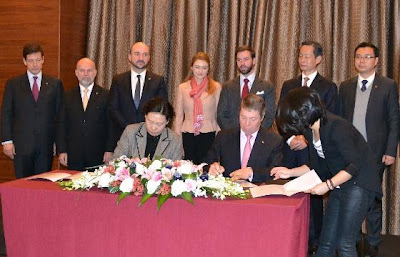 During the last couple of days, Stéphanie and Guillaume met with different politicians and businessmen, witnessed the signings of various business and collaboration agreements and attended a couple of seminars. 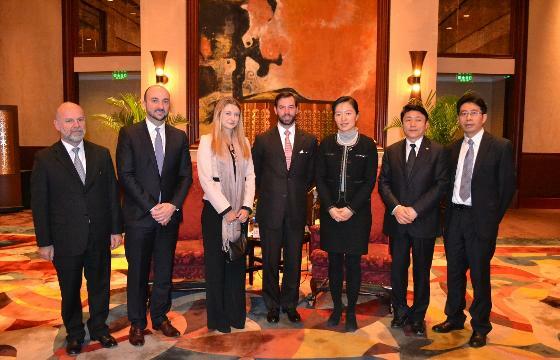 Together with a delegation of businessmen and politicians from the Grand Duchy, they visited Chongqing, Suzhou and Shanghai, after the first day had led them to Beijing and Tianjin. For a few more pictures, venture over to Wort and have a look. Tageblatt also added another few pictures to their gallery. We certainly haven't been without fault over the years, but something is repeatingly coming up that bothers us: Simply taking posts from our blog and reposting it all over the internet. It is a matter that probably many owners of blogs on royalty - I know that for a fact - and many other topics had to deal with, and it's simply annoying. Our blog has an extensive copyright section and we feel that it is time to draw even more attention to it. 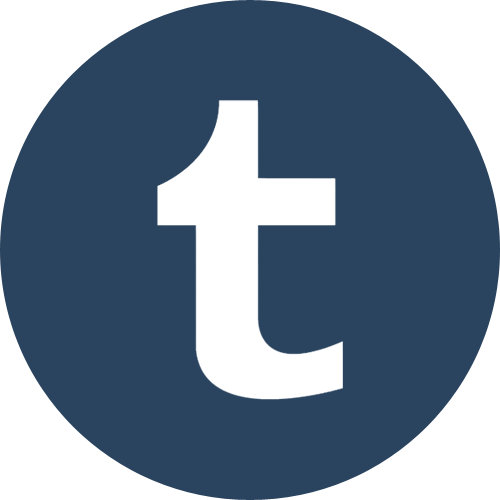 It is neither allowed to just copy and paste articles from the blog to another place, nor is it legal to translate those posts with Google Translate, Babelfish or [insert any internet translator you know] into other languages. 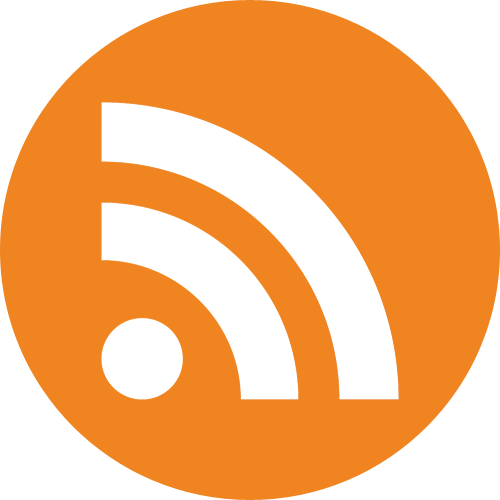 It has come to our attention that this is especially the case with various Spanish speaking forums, namely Cotillando, Charlemos, and Foros Realeza. In the past and over the last few weeks, we have been trying to deal with the matter discreetly. We have been trying to contact both the posters and forum owners. Sadly, without much success. We were told that forum owners are not responsible what is posted on their forum, which in fact they are! 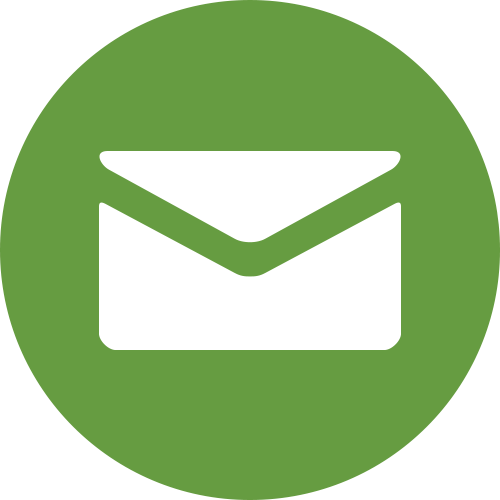 Have a look at the General Site Rules and Terms of Service of the provider of your Internet forum software. vBulletin, for example, tells us the following. In the past it has also happened that posters who had taken information from the blog without so much as a credit, told us that blogs are no legitimate source as we "simply take information from somewhere else" and repost them in another shape. Even though that might be the case in the daily work of the grand ducal family, we just do what newspapers, books, etc do; we take information and put them in a shape but we do not simply copy and paste them. 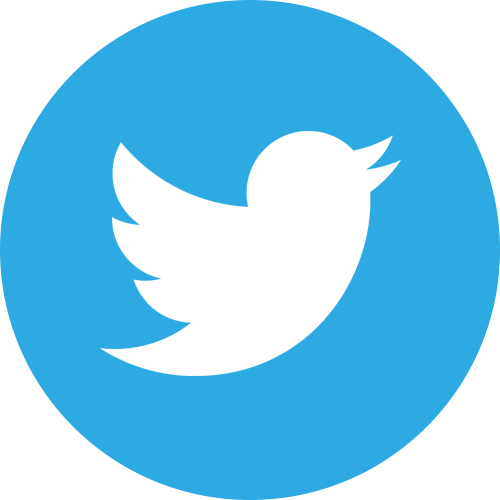 Many posts require hours or days of research from sources that are not available online. Even though it might not seem like that to some, we actually spend a lot of time online to find news that aren't on the front page. Even putting information together in another language actually requires time and effort. 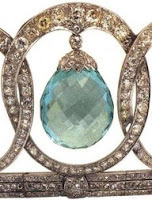 Sometimes we actually reveal news ourselves; it was this very blog that first reported about the engagement of Archduke Christoph and his Adelaide long before it was official news or the birth of little Count Leopold. 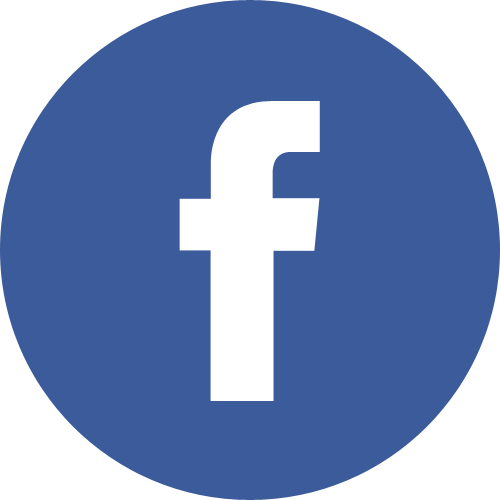 If you wish to share a post from the blog please just post a link to the blog. Do not copy, paste or translate entire posts or portions of posts! Yesterday, Grand Duke Henri and Grand Duchess Maria Teresa visited an the exhibition "The Bitter Years" by Luxembourgish born American artist Edward Steichen. The photography exhibition was first shown at the Museum of Modern Art in New York City in 1962, at the moment it is exhibited at the Centre National Audiovisuel in Dudelange. Edward Steichen was born as Éduard Jean Steichen in the Grand Duchy in 1879. Together with his parents he migrated to the United States as an infant. For more information about him, have a look here. For pictures of the grand ducal couple at the museum have a look at Wort. Today, Grand Duchess Maria Teresa, who is the president of the Luxembourgish Red Cross, welcomed Peter Maurer at the palais for an audience. Since July 1st, Mr Maurer is the new president of the International Committee of the Red Cross. For a picture have a look on the website of the cour. Here I selfishly thought that the recent wedding might have changed a thing or two. Even though the (internet community's, at least) interest in Hereditary Grand Duke Guillaume and especially new Hereditary Grand Duchess Stéphanie is high, it seems that the coverage of their activities has reached a new low. Or to put it simply, it's back to where it was pre-wedding and pre-engagement. Guillaume's economic missions have always been some kind of slow news - him visiting the Middle East have usually been delightful exceptions. This time it's no different and so we will probably end up with a handful of visuals, usually provided by the cour, the government or the Ministère de l'Economie et du Commerce extérieur. 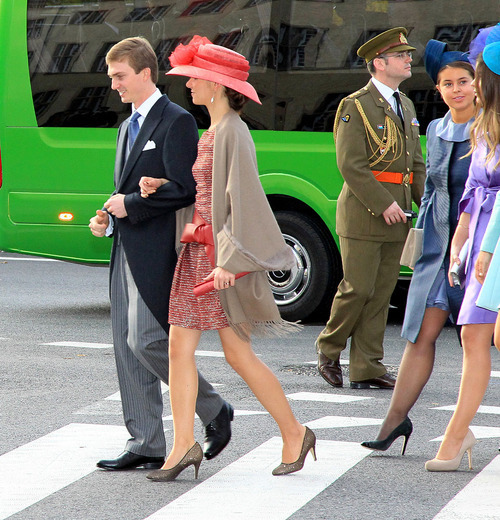 Welcome to following the grand ducal family! Meanwhile, while we (not so) patiently keep waiting with our fingers crossed, have a look at another three pictures of the first day over on the website of China Radio International. 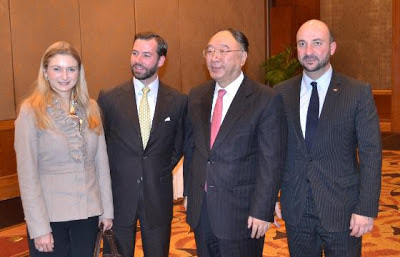 In case you have been more successful on your picture hunt of the hereditary grand ducal couple in China, please let us know. Woohoo, another two over at Xinhua. New Hereditary Grand Duchess Stéphanie and Hereditary Grand Duke Guillaume, alongside a Luxembourgish delegation of polticians and businessmen, have made their way to China for an economic mission. The economic mission, that will take the newly weds through various Chinese cities this week, started in Beijing and Tianjin. The economic mission is marking the 40th anniversary of the establishment of diplomatic relations between the People's Republic of China and the Grand Duchy. On the occassion the bubbly flowed as a reception was given. 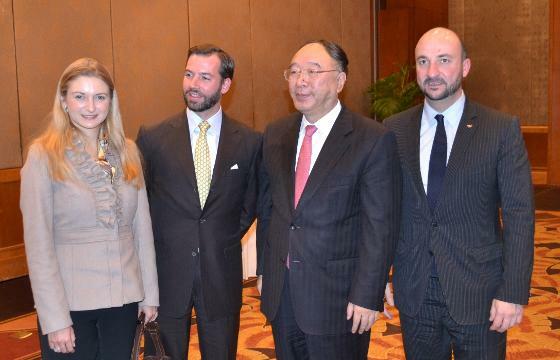 The delegation also met with the Chinese minister of trade, Chen Deming. Stéphanie and Guillaume were also present for the signing of a contract between Luxembourgish brewery Bofferding and Chinese retailer BHG, that from now on will sell the beer in China. Together with minister Etienne Schneider, the two afterwards participated in a conference organised together with the China Automotive Technology and Research Center (CATARC) in Tianjin. The Banque centrale du Luxembourg is giving out a new coin commemorating the wedding of the Hereditary Grand Duke and the new Hereditary Grand Duchess. The picture above is a first drive and apparently not definite yet. I know that a lot of people were wondering why the Grand Duke can also be seen on the coin. The simple explanation: Because he has to; Luxembourgish law requires that the head of state is visible on all coins. Additionally, Guillaume and Stephanie will go postal again, another stamp featuring a wedding picture will be issued in a few weeks. Last week, the Grand Duchess had another two audience; on the 15th and 16th of November respectively. For the first one, she welcomed the president of the fund labeling agency LuxFlag at the palais. A day later, Grand Duchess Maria Teresa received two delegates from the organisation ErwuesseBildung, that is run by the Christian centre of adult education of the Catholic church in Luxembourg. On a Grand Ducal family related note, Luxembourg's mayor Xavier Bettel and the Dutch ambassador Petrus Wouterus Kok planted the last of 1.300 tulips in the gardens of the Villa Vauban. 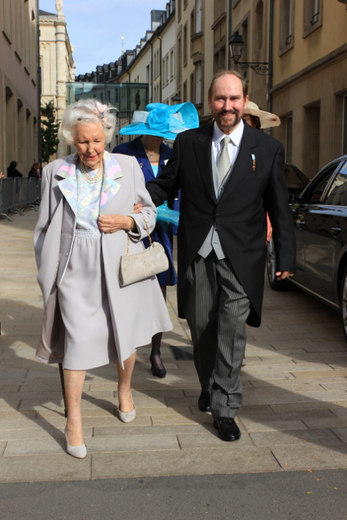 They were a gift to the city of Luxembourg by Queen Beatrix of the Netherlands during her state visit back in March. A bit cliché, I know, but I bet it will look stunning in spring next year when the tulips start to blossom. The neogothic church St. Eprve was built in the 19th century and is situated in the old town of Nancy. On November 26th, 1874, the church was elevated to minor basilica by Pope Pius IX. The basilica is dedicated to St. Eprve (English: Saint Aprus, German: Sankt Aper), bishop of Toul. Last Friday, the Grand Duchess attended a round table conference with the topic "The microcredit: A plus for Luxembourgish enterprises". The event was organised by the FEALU (Female Entrepreneurship Ambassadors Luxembourg) and took place in the course of the microfinance week. 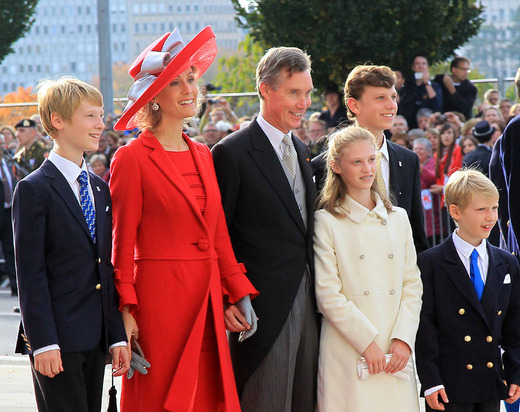 More information and pictures are available on the official website of the grand ducal family. Two days ago, Prince Nikolaus of Liechtenstein was in Vienna to deliver a speech as part of the European Prize Coudenhove-Kalergi 2012 ceremony. This year's award was given to the president of the European Council Herman van Rompuy. The award ceremony was held to kick off the festivities of 90 years of Paneuropa. Prince Nikolaus is the vice-president of the European Society Coudenhove-Kalergi. In 1923, Count Richard Nikolaus von Coudenhove-Kalergi published the manifesto "Paneuropa", that presented the idea of a unified European State. The same year the Paneuropean Union was founded. In more recent years it became closely associated with the late Archduke Otto of Austria, the last crown prince of the Austro-Hungarian empire, also known as Otto von Habsburg, who was the president from 1973, when he took over from Count Richard Nikolaus von Coudenhove-Kalergi, until 2004. The Paneuropean Union is probably most famous, at least where humble me lives, for organising the Pan-European Picnic at the Austro-Hungarian border in August 1989. Otto von Habsburg, Hungarian Minister of State and reformer Imre Pozsgay and the other organisers distributed flyers to East-Germans on holiday in Hungary to come join the picnic. During the course of the picnic the border between Hungary and Austria was opened for about three hours allowing more than 600 East Germans to flee via Austria to Western Germany - marking the start of the fall of the Iron Curtain. Until the fall of the Berlin Wall about three months later about 70.000 East-Germans would cross the Austro-Hungarian border to flee to the West. At least two of Archduke Otto's children, namely Archduke Karl, head of the Habsburg-Lorraine family, and Archduchess Walburga (also known as Walburga Habsburg Douglas) were also in Vienna for the three day event. Archduke Imre, son of Otto's nephew Archduke Carl-Christian and his Luxembourgish wife Princess Marie-Astrid and thus nephew of aforementioned Prince Nikolaus, also was among the guests. Prince Robert, cousin of Grand Duke Henri and owner of the Domaine Clarence Dillon and thus of the famous wine estates Château Haut-Brion and Château La Mission Haut-Brion, has enhanced his properties. As it became known now, the prince bought the Domaine Allary Haut-Brion (formerly Domaine de la Passion Haut-Brion) that borders his own estates. In March 2008 the value of the land on the estate now belonging to Prince Robert was estimated at a value of £900,000. Prince Nikolaus of Liechtenstein, husband of Luxembourg's Princess Margaretha, has also been busy during the last couple of weeks and months. The principality is looking for an unbundling of the state and the church. Prince Nikolaus, who is the brother of the Prince Hans-Adam II. 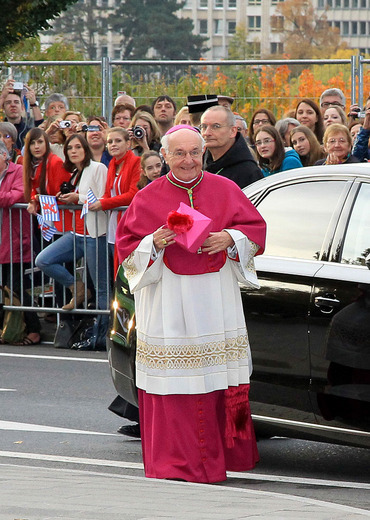 and his country's non-resident ambassador to the Holy See, was asked by Liechtenstein's government to head a delegation that negotiated a concordat with the Vatican to achieve a secularisation. Yesterday evening, Prince Nikolaus took part in a special non-public session of the country's parliament. The newly-weds Hereditary Grand Duke Guillaume and Hereditary Grand Duchess Stéphanie are back from their oh so secret honeymoon (will we ever know where they went?!...) 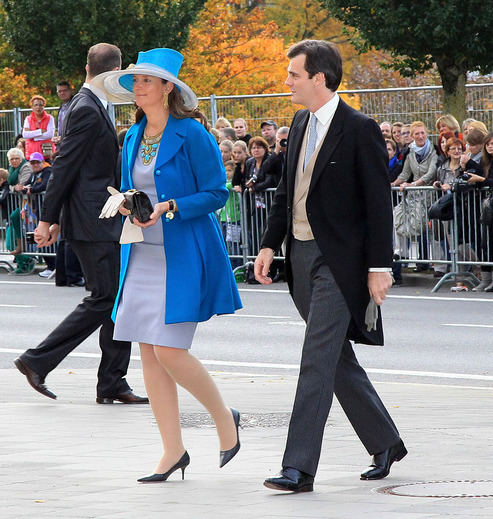 and joined Grand Duke Henri and Grand Duchess Maria Teresa for their first post-wedding engagement today. Together the four welcomed Muhammad Yunus, the 2006 Nobel Peace Prize laureate, at the palais. Mr Yunus is currently in Luxembourg for the Week of Microfinance, events of which the Grand Duchess has attended during the last couple of days and will continue to do so in the next couple of days. Grand Duchess Maria Teresa has been involved in the business of social business and microfinance for many years, during the last two or three years she was often joined by her oldest son. On Tuesday November 13th, Prince Jean attended the opening of the exhibition "La Maison Royale de Bourbon des Deux Siciles" portraying (surprise, surprise) the history of the royal House of Bourbon-Two Sicilies, an Italian cadet branch of the House of Bourbon. The official website of Prince Jean of France, Duke de Vendôme has a report and pictures of the event that took place in Paris. More pictures are available at Getty Images. Other royal guests, apart from the Grand Duke's brother, include the Duchess of Vendôme, Prince Laurent of Belgium, the Duke and Duchess of Castro, Prince Antoine and Princess Elisabeth of Bourbon-Two Sicilies, Prince Alvaro and Princess Antonella of Orléans, the Count and Countess of Paris as well as the Princess Napoléon. Yesterday evening, Grand Duke Henri attended the opening night of the Brazil Film Festival in Luxembourg to watch two different films from the South American country. He was joined by his maternal aunt Princess Marie-Esméralda of Belgium, half-sister of the late Grand Duchess Joséphine-Charlotte, and her husband Salvador Moncada. Before actually watching the films, the Grand Duke and his relatives happily chatted to the crowds at a cocktail reception at the cinema Utopolis in Kirchberg. Princess Marie-Esméralda was present because her foundation financed one of the screened films. The documentary "La Visite du Roi" portrays the visits of King Leopold III's to the Xingu territory in central Brazil. Afterwards another film titled "Xingu", which shows the fight of the Villas Bôas brothers to make the area a national park. Pictures can be found on the website of Wort. Tonight, the 4th European Microfinance Award was handed over to the Philippine microfinance institution Aski. Grand Duchess Maria Teresa was on hand to give the award to this year's winner. Together with two other organisation, one from Kyrgyzstan and another one from Bolivia, Aski will share €100.000 to continue with their fabulous work. The European Microfinance Award is organised jointly by the Luxembourg Ministry of Foreign Affairs, the Luxembourg Round Table on Microfinance and the European Microfinance Platform to promote microfinance initiatives and highlight their contribution to the development of the sector. This year's award highlighted the work in the field of "Microfinance for Food Security". Pictures can be found on the website of Tageblatt and at Wort. Yesterday, Grand Duchess Maria Teresa welcomed the president and CEO of the Women’s World Banking (WWB), Mary Ellen Iskenderian, as well as two of her colleagues Madelaine Bear and Carola Saba at the palais. Currently there is a week of microfinance going on in the Grand Duchy, so during the next couple of days there will be more microfinance and social business related events on the agenda of the Grand Duchess. Pictures of yesterday's event are available on the website of the cour. The Hereditary Grand Duchess was born as Countess Stéphanie Marie Claudine Christine de Lannoy on February 18th, 1984 in Ronse, Belgium. She is the daughter of Philippe, Count de Lannoy (*1922) and Alix, Countess de Lannoy (1942-2012) and has seven older siblings, Count Jehan, Count Christian, Nathalie Hamilton, Countess Gaëlle, Count Amaury, Count Olivier and Isabelle de le Court. She grew up on the family estate in Anvaing in the Belgian province Hainaut. Then Countess Stéphanie started her primary education at the Dutch-speaking school Sancta Maria in Ronse. The first two years of her secondary education, she spent at the Collège Sainte-Odile in Lambersart, Northern France. Afterwards she transferred to the Brussels-based Institut de la Vierge Fidèle. She graduated from secondary education in 2002. Afterwards she spent a year in the Russian capital Moscow to learn Russian and take violin classes. After returning from Russia, she then spent 3 months in Munich to learn German. She started her university education at the Université catholique de Louvain, where she would spend the next three years to study Germanic Philology. She obtained her Bachelor’s degree with distinction. After graduating, she moved to Berlin, Germany, where she attended the Humboldt University for her Master’s studies. She wrote her Master’s thesis in German about the influence of German romanticism on Russian literature using the examples of E.T.A. Hoffmann and Alexander Pushkin. After finishing up university, she decided to stay in Berlin for a year and did an internship at the L'Agence Wallone à l'Exportation at the Belgian embassy. When she returned to Belgium, she started to work in an investment firm in Brussels. During this time she lived at her family's home in the Belgian capital. Since a young age, Hereditary Grand Duchess Stéphanie had an interest in classical music; she can play piano and violin herself. During her teenage years she discovered a passion for literature, which she likes to read in its original language. Besides her native French, she is fully fluent in German and English. Of course she is learning Luxembourgish and also has some knowledge of Russian and Dutch. Being involved in voluntary work, Stéphanie has made many trips with youth groups. In her free time, she enjoys skiing and swimming. On April 27th, 2012, she was introduced to the public when she announced her engagement with Hereditary Grand Duke Guillaume. The two had been a couple for a few years, after being introduced by mutual friends a few years earlier. Even though there was an instant connection, the two lost track of one another before finally starting to date. 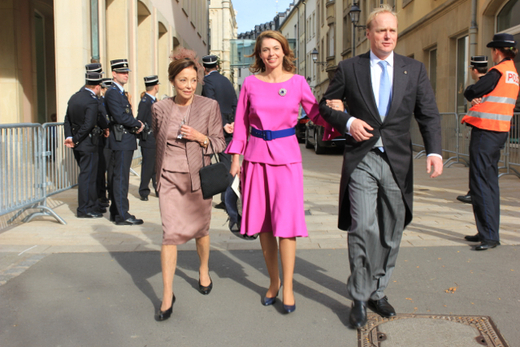 Upon her marriage to the Hereditary Grand Duke – civilly on October 19th and religiously on October 20th, 2012 – she gained Luxembourgish citizenship. From the religious wedding on, she is known as “Her Royal Highness Princess Stéphanie, the Hereditary Grand Duchess of Luxembourg, Hereditary Princess of Nassau and Princess de Bourbon de Parme”. Since June 2012, she has been a member of the board of directors of the Fondation du Grand-Duc et de la Grande-Duchesse. Hereditary Grand Duchess Stéphanie has expressed the wish to dedicate some of her time fighting solitude in all age groups. After wading and wading and wading and wading through tons of pictures of the wedding of Hereditary Grand Duke Guillaume and his new wife née Countess Stéphanie de Lannoy, I have come up with an exhaustive (and exhausting) guest list. I suspect that I have missed many guests or that I might have misidentified some of them, so my apologies if that happened. Added to my own identification are people from the released guest list, plus people that were pointed out to me by others (thanks to everyone!). I know that some of the titles are not entirely correct; of course it should be “Henri, Grand Duke of Luxembourg” or “The Grand Duke of Luxembourg”. Nevertheless, to avoid confusion, every person is listed as “*Title* *Name* of *Place*”. In some case there was no appropriate translation into English, so the title in the original language stayed. The guests are in alphabetical order by their last name / country of origin, starting with the immediate families of the groom and bride. All wives are listed with their husbands names / titles, even though some of them might still be styling themselves with their maiden names / titles. Wives of noble descendent are mentioned as “née *Title* of *Place*” because I think it is interesting to see the family connections and interrelatedness. Under-aged children are listed with their parents. Orignally, I planned to also list all the dignitaries and politicans to attend the wedding. But as the wedding had hundreds of guests, it would be tiring for me (and probably also you) to list them all. Just to give you a short run-down... Of course, prime minister Jean-Claude Juncker and his whole cabinet were there, as were loads of members of the parliament. There were even more politicians in form of mayors like the mayor of Luxembourg City Xavier Bettel. 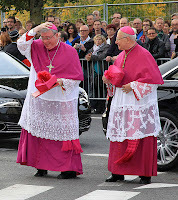 Also in attendance were the presidents of the supreme and of the adminitrative courts of Luxembourg, as were the leading figures of the Luxembourgish army and the grand ducal police. Additionally, there were some European dignitaries like Viviane Reding, European commissioner for justice, fundamental rights and citizenship, José Manuel Barroso, president of the European commission, and Vassilios Skouris, president of the European court of justice. All resident ambassadors to the Grand Duchy were among the guests. The cour grand-ducale and employees of the ministery of foreign affairs were out in full force to accompany the above mentioned guests. Last but certainly not least, the designer of the dress Elie Saab, his wife Claudine and their son Elie Jr were also among the guests; as was Edouard Vermeulen, the man behind the Natan creations. In rather surprising news, Prince Félix visited Georgia, more specifically the Château Mukhrani, a winery near Mtskheta about 10 kilometres north of Tbilisi, recently. As I do not know any Georgian whatsoever, I have no clue what is said in this video but check it out nonetheless as it shows Prince Félix on his tour through the castle and the estate surrounding it. For the very same reason (the lack of knowledge of the Georgian language on my part), I have no idea why Prince Félix was there in the first place but can, however, tell you that he was there with Prince Lelio Orsini d'Aragona, whose mother is Princess Ketevan Bagration of Mukhrani of the former Georgian royal family who once owned the Mukhrani estate. 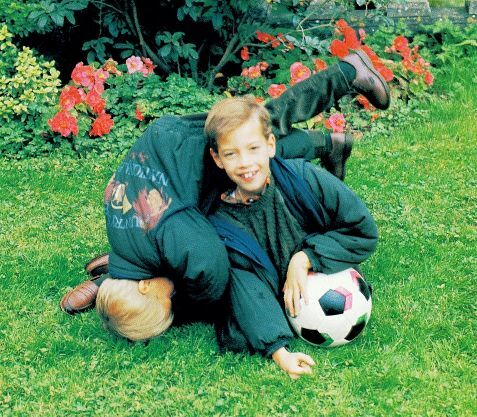 Prince Félix and Prince Lelio have attended school together and are friends since. 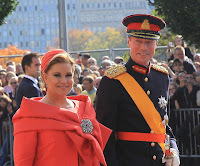 There were quite a few events in the last couple of days that were either attended by the Grand Duke or the Grand Duchess but not mentioned in Luxembourg's online media. On October 7th, Grand Duke Henri went to an academic session organised on the occasion of the 50th anniversary of the DuPont de Nemours, according to themselves "a World Leader in Market-Driven Innovation and Science". On October 8th, Grand Duchess Maria-Teresa attended an award's ceremony by "1,2,3, GO Social" to hand out prizes to the winning social or solidary entreprises. 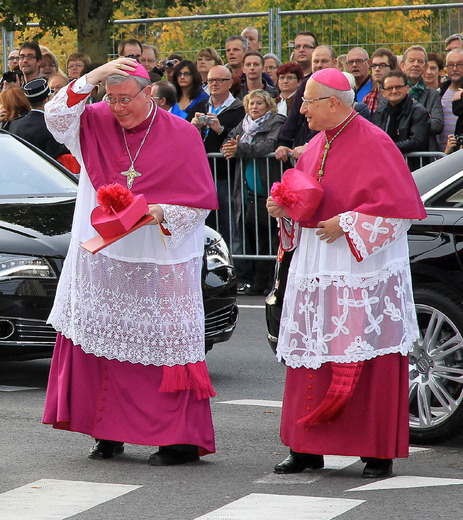 The event took place in Esch-Belval. A day later, on October 9th, the Grand Duke welcomed Mike Lyden, general manager of the new NATO Support Agency (NSPA) at the palais for an audience. 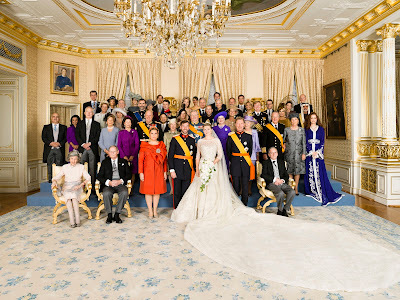 If you still haven't got enough of the wedding of hereditary grand ducal couple, have a look at the following guest post over at "The Royal Representative": "A Tiny Country's Fairy-Tale Wedding". It's that time of the year again. The holiday season begins with the annual Red Cross Bazaar at the Halle Victor Hugo in the Limpertsberg district of Luxembourg City. The Grand Duchess, as patron of the event and President of the Red Cross Luxembourg, always attends the bazaar and so she did this year. Though she is often accompanied by other family members, she wandered the stands all on her own (family-wise) this year; nevertheless, she seemed to have a lot of fun slurping caipirinhas and go through the countless goods offered. In addition to providing services for residents of Luxembourg the proceeds from the bazaar will benefit four other worthy causes in Haiti, Laos, Nepal and Burundi. Wort, L'essentiel and Tageblatt offer galleries of pictures of the event, RTL has a video including an interview with the Grand Duchess. 31 years ago today, the then Hereditary Grand Duke Henri and his lovely new wife Hereditary Grand Duchess Maria Teresa welcomed an itty-bitty baby boy almost exactly nine months after their wedding. The sound of cannons announced little Guillaume’s birth while many Luxembourgers were having their lunch. 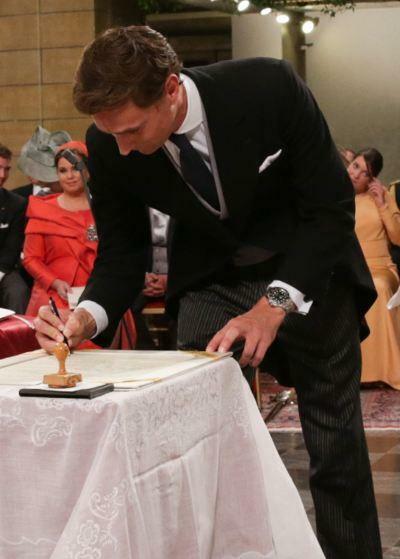 The young boy was christened Guillaume Jean Joseph Marie, his godparents being his aunt Princess Marie-Astrid and his uncle Prince Guillaume. 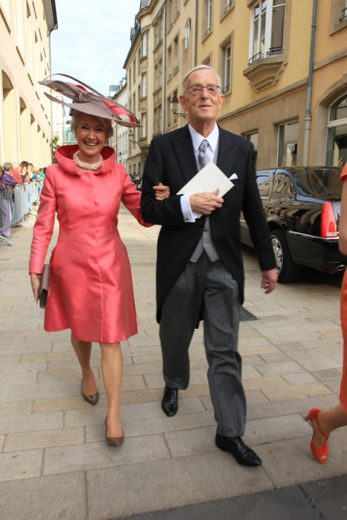 Most recently Luxembourg's heir to the throne caught the world's eye when he married Belgian born Countess Stéphanie de Lannoy in a beautiful two-day event. So it's a good time as any to look back on Guillaume's life; especially because we have a few new readers here on the blog - Welcome! - who are probably not as familiar with den Ierfgroussherzog as those who have been long interested. Guillaume started his education at the local primary school in Lorentzweiler, before continuing to the Lycée Robert Schuman in Luxembourg City. He then attended the super-expensive and equally exclusive College Alpin Beau Soleil in Villars-sur-Ollon, Switzerland, where he received his French Baccalaureate in 2001. After completing school, the Hereditary Grand Duke undertook a 44 week education at the Royal Military Academy Sandhurst; something his father and his uncle Prince Jean had done before him and his brother Prince Félix as well as his cousins Prince Josef, Archduke Alexander and Prince Wenceslas would do after him. 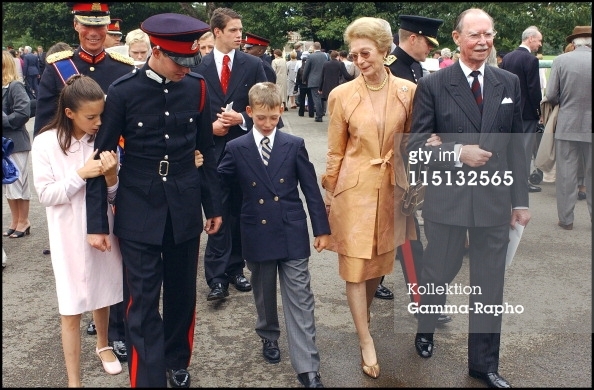 On August 9th 2002, he had his passing out parade that was attended by his parents, siblings, paternal grandparents and his cousin Archduke Imre. In December that same year, he took the oath as an officer in the Luxembourgish army. Now he holds the rank of a Lieutenant-Colonel. He attended Durham University and Brunel University in Great Britain before graduating from Institut Albert le Grand in Angers, France. Actually he got his degree from the Université d' Angers as both institutions have a partnership agreement. The humanities and political science program is completed at Albert le Grand and the degree is issued by Université d' Angers. Guillaume completed the program with honors in 2009. In between his university education, he did various internships in Belgium, England and Spain. Iin 2005 He took part in the United Nation’s “Millennium Conference” in New York. In 2006 he also attended the Institut Philanthropos in Fribourg, Switzerland, something his archducal cousins Imre and Christoph also did. 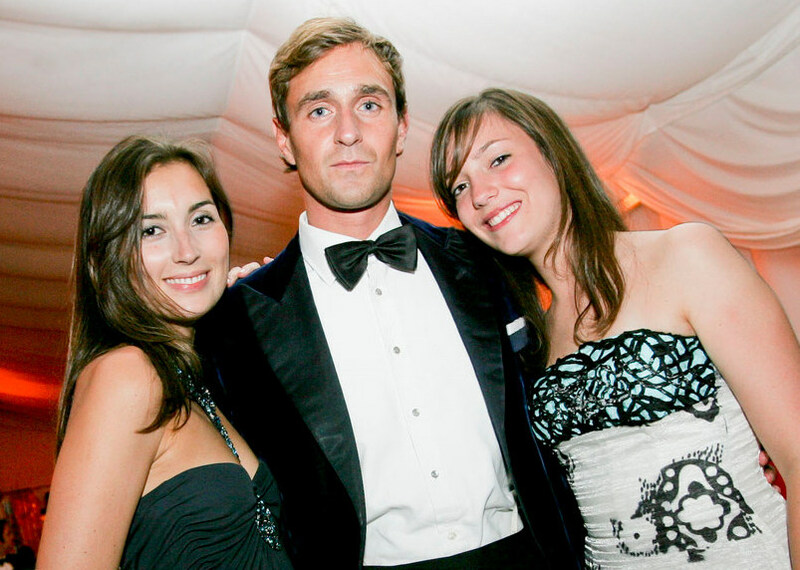 Of all the Grand Duke's children only Guillaume is fully fluent in Luxembourgish, French, English, German and Spanish. Since graduating from university in 2009, the Hereditary Grand Duke has taken to his job full time, which means that he frequently attends various events relating to the Grand Duchy at home and abroad. He has been honorary president of the "Board of Economic Development" (today commonly known as "Luxembourg for Business") since 2001. He is a frequent traveller between Luxembourg, the Middle East, Asia, North America and other parts of the world inbetween to accompany delegations on economic missions. Since 2005, he is a member of the Conseil d'Etat (State Council) and regularly attends commissions and plenary sessions. 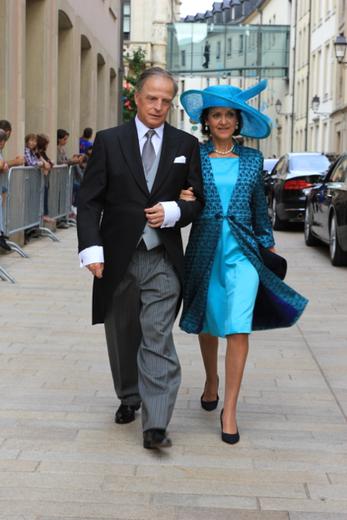 He is also a member of the board of the Fondation du Grand-Duc et de la Grande-Duchesse. In early 2012, he did an internship at the European Union in Brussels. He is a patron of the "Luxembourg Youth Hostel Association", the "Association nationale des victimes de la Route", the “Jeunesses Musicales du Luxembourg" and the "European Union Youth Wind Orchestra", as well as the "Luxembourg Cycling Federation". 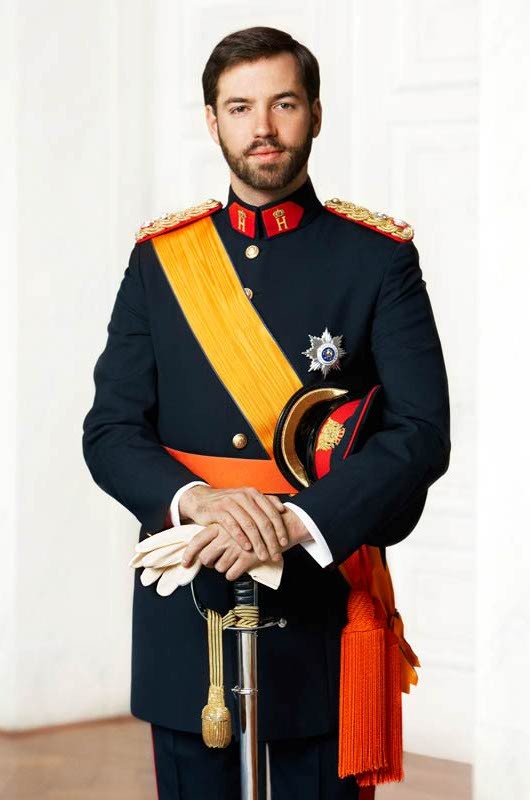 Funnily enough, I have seen basically every other family member (the Grand Duke, the Grand Duchess, Grand Duke, Jean, Prince Félix, Prince Louis, Princess Tessy, Prince Gabriel, Prince Noah, Princess Alexandra, Prince Sébastien and Princess Margaretha) but Guillaume attend cycling (related) events. Guillaume is the honorary president of the Fondation Kräizbierg, a charity for the disabled, since autumn 2010, after being its chairman for more than ten years. In summer 1997, Guillaume participated in a humanitarian aid camp in Nepal, as a member of the Luxembourg Scout movement. Two years later he went on a a charitable mission to Aguas Callentes to bring social and educational assistance to children in one of the poorest regions of Mexico. He is very interested in Social Business and frequently accompanied her mother on trips concerning this subject. include biographies and historical novels. He enjoys both classical and modern msuic. He piano and guitar. When he was a child, he sung Pueri Cantores Choir of Luxembourg. While in Switzerland, he was a singer in the school rock band. Guillaume also enjoys theatre, he took part in several school plays during his studies in Switzerland. He is also a keen sportsman and enjoys football, tennis, skiing, swimming and water sports. After having been linked to different woman, the Hereditary Grand Duke Guillaume announced his engagement to Countess Stéphanie de Lannoy on April 27th, 2012. The couple married civilly on October 19th and religiously on October 20th. They are currently enjoying their honeymoon at an undisclosed location. Later this month, they will embark on an economic mission to China. 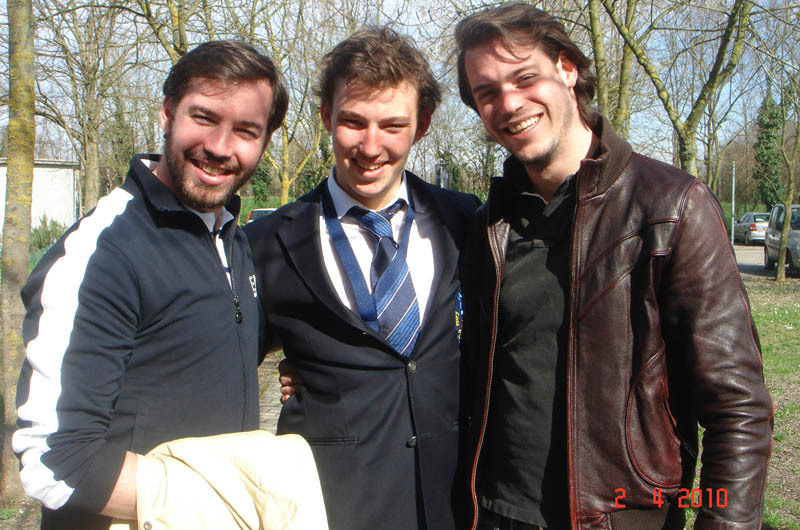 Guillaume is the godfather of his brother Sébastien, to his nephew Prince Noah and his cousin Prince Paul-Louis, as well as Prince Emmanuel of Belgium and Princess Ariane of the Netherlands.